"Arthur" the remake of the 1981 film of the same name, did not live up to its predecessor, regarding the promiscuous Brit living in New York. The reboot, which stars British comedic actor, Russell Brand, in the role, did not quite do the late Dudley Moore justice. Most filmgoers probably did not look past the surface of this film's trailer, to buy a ticket to see it, as the movie so paled in comparison to what came before it, the deterioration in quality was immediately apparent. The film did have a few funny moments, but it took way too long for them to arrive. Some jokes did fall somewhat flat, while ironically characterizing the Obama Administration's view on economics. When officials inform Arthur he is living a lavish and meaningless life, by stating, "How do you explain this frivolous spending during a recession" - he simply goes to an ATM, obtains funds from his family's account and spontaneously begins throwing it all over a room full of people while proclaiming, "Free money, recession's over, we're in a boom." The Obama school of economics, indeed. Speaking of Obama, Hollywood has been name dropping him in their movies, as a means of promoting him. This is being done in bids at propping him up, after their insane agenda, bad advice and constant presence at the White House, firmly planted the first African-American presidency in trouble (see polls). 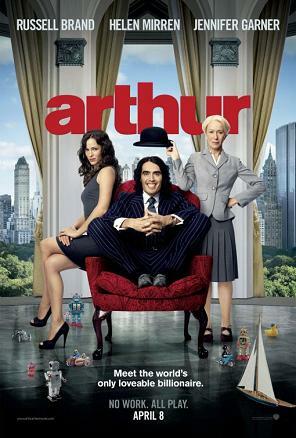 When Arthur is confronted by his mother about his debauched lifestyle and her desire for him to marry a domineering woman he does not love, she admonishes him by stating, "As the charming coffee colored gentleman (Obama) that runs this country said, 'It is time to put aside childish things.'" Actually, that phrase came from the Bible. Leave it to Hollywood to compliment and insult in the same sentence, where no matter what they tell you, race is a factor.